Hip No. 24, a son of Flatter consigned by Stuart Morris, Agent, was sold to Stan Hough, Agent for Sagamore Farm, for $210,000 to top the Ocala Breeders’ Sales Company’s 2016 Selected Yearling Sale. The bay colt is out of Madoffwiththecash, by Dixie Union, a full sister to graded stakes winner Nothing But Fun. Hip No. 99, a bay filly by Bernardini consigned by Baccari Bloodstock LLC, Agent, went to Justin Casse, Agent, for $200,000. She’s out of stakes winner Seacrettina, by Sea of Secrets, a half sister to graded stakes placed Ramsgate. Hip No. 133, a dark bay or brown colt by Shanghai Bobby consigned by Summerfield (Francis & Barbara Vanlangendonck), Agent, was sold to Stonestreet Stables LLC and M. V. Magnier for $160,000. A half brother to stakes winner Katie’s Kiss, he’s out of Sydney’s Kiss, by Boston Harbor. Rigney Racing LLC paid $155,000 for Hip No. 174, a daughter of Soldat consigned by Woodford Thoroughbreds, Agent. The dark bay or brown filly is out of graded stakes placed stakes winner Baldomera, by Doneraile Court, and is a half sister to graded stakes winning OBS graduate Big John B. Hip No. 56, a bay colt by Paynter consigned by Janie Roper, Agent, went to C R K Stables LLC for $150,000. He’s out of Oral Argument, by Outofthebox, and is a half brother to stakes placed Tupancy Links. Hip No.144, a son of Uncle Mo consigned by Stuart Morris, Agent, was purchased by FHMB for $150,000. The dark bay or brown colt, a half brother to graded stakes winner Maddalena, is out of Two Foxie, by Fair Skies. Moneyballs Racing & Sales paid $150,000 for Hip No. 227, a daughter of Uncle Mo consigned by Imagine… The dark bay or brown filly is out of Dark Nebula, by Exchange Rate, a daughter of stakes placed Pure Glitter. Hip No. 245, a dark bay or brown colt by Gemologist consigned by Select Sales, Agent for Machmer Hall and Grey Dawn Stables, went to H. H., Agent for $150,000. He’s out of Evening Sun, by Dixie Union, a half sister to stakes placed Askara. For the day, 138 horses sold for a total of $5,612,100, compared with 150 yearlings bringing $6,774,500 at the 2015 Selected Sale. The average price was $40,667 compared with $45,163 last year, while the median was $25,000, compared with $35,000 last year. The buyback percentage was 38.1%; it was 21.9% a year ago. 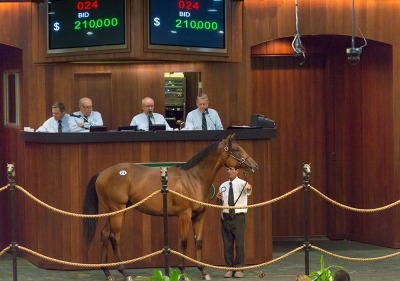 Fifteen horses sold for $100,000 or more compared to eleven in 2015. The sale continues Wednesday at 10:30 a.m. with Hip No.’s 275 – 660 selling in the first of two Open sessions. The session will again be streamed live via the OBS, Blood-Horse and Daily Racing Form websites.